Hospitals are a vital part of our community. They are not a fun place to visit if you are having a procedure done or have health problems. This morning I had to visit our local hospital for an x-ray. Recently I have been experiencing pain in my left thumb. When I visited the doctor I was told that this could be a repetitive strain, yes I am on my phone a lot, so this will not help. Or worst case scenario I have an early onset of arthritis. When I went in to have my x-ray I was greeted by a medical radiology student who asked for my consent to perform my x-ray. As I was stood there waiting to have my x-ray I could not help but listen in to their discussions. The qualified radiology nurse was telling the student all about the machine and this got me thinking about how, when I was at school, I had thought about a career in nursing. 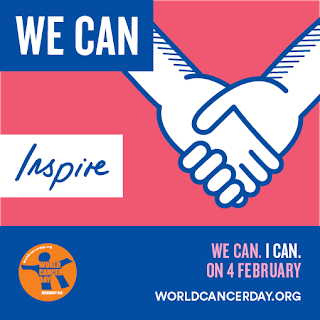 Today is also World Cancer Day. The diagnosis and cure of so many cancers is all thanks to the technology that is radiography. We, as a family, have lost people to this devastating disease but I am also so proud and lucky to say that we have people who have had it, beat it and remain cancer free! Radiology really is amazing and certainly saves and improves our lives. As with a lot of medical positions they are always on the look out for new people to train up and fill positions. I know that part of me does wish that I had followed nursing when I was younger but naivety won and studying didn't! But I am a true believer in things happening for a reason and the paths that you choose in life make you the person that you are today. But if you are looking for a new career I thought that I would share a little bit of information about radiography. Radiography, the technique of using electromagnetic radiation and X-rays to view the inside of the human body, is at the heart of modern medicine. Radiographers are highly trained medical professionals who use the high quality images they produce to diagnose and treat a range of medical conditions and diseases. The role of a radiographer is varied and diverse and radiography jobs can be based anywhere from the trauma unit of a busy Accident and Emergency department, to a small community health team or the physiotherapy team of a private sports hospital! Here we explain about the different types of radiography jobs that may be available to you once you qualify. What does the job of a Diagnostic Radiographer involve? Diagnostic radiographers are a vital part of the front line health care team and their primary role is to produce accurate medical images to assist in the diagnosis and treatment of a patients health problems or injuries. By using high tech equipment such as MRI (magnetic resonance imaging) and CT (computer tomography) the radiographer can assist in a variety of medical roles. These can range from assisting in operating theatres, to specialising in trauma, cancer diagnosis or acting as a mobile X-ray unit for those patients who are too ill to travel to hospital. What does the job of a Therapeutic Radiographer involve? Therapeutic radiographers play an important role in the treatment of diseases such as cancer and the management of malignant and benign growths and tumours. Qualified to plan and deliver courses of radiotherapy to patients, a therapeutic radiographer will use their expertise to target the cancer or tumour, ensuring that the healthy tissue of the patient undergoing treatment is at minimal risk of exposure. Usually specialists in oncology (cancer), therapeutic radiographers see their patients weekly or monthly, often building up close relationships with the people they are treating. Therefore, a friendly and sympathetic nature is an important characteristic of this job. What are the long-term prospects of a job in Radiography? At the forefront of new advances in medical technology, radiography is an exciting field to work in. The profession benefits from a grading structure, meaning there are many opportunities for promotion and regular increases in salary. To qualify, you will need to complete a three-year degree course, which will be composed of a mixture of study and clinical placements. For more information on getting into radiography, have a look at the excellent site http://radiographycareers.co.uk/.